In the beginning of July we sent out our first Korea Box to the first subscribers and the reactions were incredible. Thank you to all our subscribers, for making this so much fun and enjoyable. 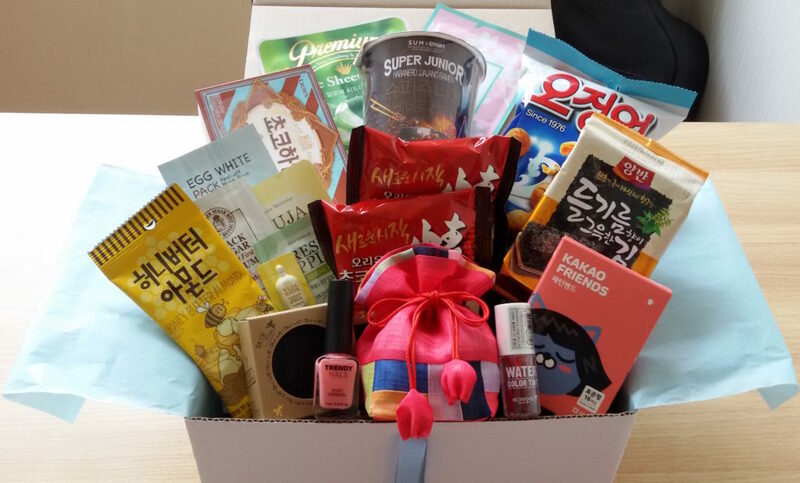 What did you find in your July Korea Box? We want to share with you what we packed in the July box, just in case you haven’t had the pleasure of opening your own box. Interested in the August box? Subscribe to your Korea Box. Is Super Junior Hot? Their noodles definitely are! 1. Open and only leave the noodles in the cup, pour boiling water until the line inside and leave it for 4 mins. 2. Strain noodles and leave 8 spoons of water. 3. Add soup base and vegetable mix. Mix well and serve. Who would ever come up with making a snack with squid and peanuts together? The Koreans!! When Koreans drink beer, they often eat squid and peanuts together. This is one of the most famous snack in Korea since 1976. Waffle snacks filled with chocolate cream and hazelnuts! Wanna try the Korean way? Put the snack in the freezer and try it cold! We call this type of seaweed ‘김 (gim)’ in Korea and we know how to make seaweed super tasty and healthy! Fresh made rice, piece of Kimchi and 김! YUM! Orion makes the original Chocolate Pie since 1974 and this snack is the one of the most expensive South Korean snack sold in North Korea’s black market! [ Step 1. Pore Cleansing ] Skin becomes very oily in Summer and that causes blackhead and whitehead. Deep-cleanse your skin with Skin Food Charcoal Natural Handmade Soap and get rid of those blackheads on your nose with Skin Food Egg White Peel-off Nose Pack. 1.Wash your face with soap to remove oil. 3.Place the strip on the nose with dry hands and pat down for proper adhesion. 5.When the product is completely dry, remove the product from the edges and wipe away any residue. 6.Tighten your pores with Skin Food Fresh Apple Pore Control Essence. Apply right after washing your face. Replenish minerals to your skin with black sugar! Did you know that Yuzu(Yuja) has approx. 3 times more vitamin C than lemons? Prevent and whiten melanoma with Yuzu! [ Step 3. Special Treatment ] The strong sunlight can be very damaging for your skin. Moist and Sooth your skin with the Aloe Sheet Mask and Cherry Blossom Mask from Missha. 1.Wash your face and put toner on the face. 2.Spread the sheet mask on the face and leave it for 15-20mins. 3.Remove the mask and gently pat until fully absorbed. [ Step 4. Have Fun with Colors ] Lip-tints are a must item for Korean lip make-up! Try Skin Food Water Color Tint and have fun with The Face Shop Trendy Nails (We love colours so much. How about you?)! Beautiful Korean Traditional Pouch that is perfect for small items. Did you get a Korea Box in July? How did you like it? The August box is coming soon! Get it now.